The Camaro line was greatly simplified this year, starting with discontinuing the slow-selling LT model, and dropping the base Z28. 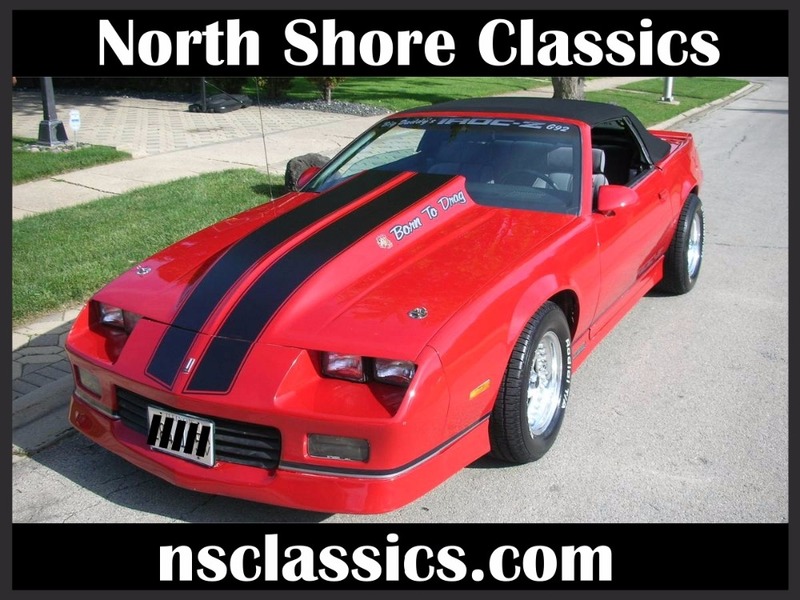 The IROC-Z package proved popular and the package became standard on Z28s. This resulted with two models remaining, the base coupe and the IROC-Z. Without the Z28 to bridge the gap between the base Camaro and the flagship IROC-Z, the previously standard aluminum 16-inch 5-spoke wheels were now an option - "base" IROCs now got the previous year Z28's aluminum 15" 5-spoke wheels (which also became standard on the base coupes) and P215/65-15 tires. Also the old Z28's ground effects and spoilers were now standard issue on the base Camaro coupes. Base models received a new raised spoiler for the first half production year. All engines were fuel-injected this year; the 2.8 (173) running 135 HP at 4900 rpm and 160 lb.ft at 3900 rpm, the 5.0L 305 cid V8 gained throttle-body injection, bringing net horsepower to 170; the 305 TPI manual transmission models were rated at 220 HP @ 4400 and 290 @ 3200, Automatic at 195 HP @ 4000 and 295 @ 2800 and the 350 TPI got a small boost to 230 HP @ 4400 and 330 @ 3200. G92 (performance axle ratio) available only on IROC-Z with 5.0 TPI (LB9). All 1987 350 TPI L98 IROC-Z's came standard with the 3.27 BW rear end and everything that was included with G92 but did not have the G92 RPO code because it was not mandatory; this changed in 1988 however when a 2.77 rear was standard and G92 had to be specified to get the 3.27's. The IROC-Z also treated to some small cosmetic changes. The "Z28" logos on the ground effects below the doors and on the rear bumper changed to read "IROC-Z". The large IROC-Z call-outs on the door moved from the front of the doors to the back, to put some space between the logos. Option code DX3 offered buyers the option of deleting the IROC-Z's door decals and stripes for a $60.00 credit. Optional 16" aluminum wheels were redesigned with two lines instead of one large line in each spoke, and center caps backgrounds changed from a black to silver. Dash badges on the IROC still read "Z28" on top and "IROC-Z" below. The vin code 8 is the engine code for a real TPI 5.7L IROC.